We’re going back to school! The Festival of Colour Schoolfest programme offers free and low-cost events for primary, intermediate and secondary school students. 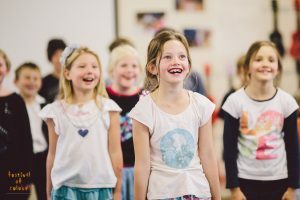 A variety of our performers run workshops and put on special performances for students, and we provide tickets for school groups to some of our public performances. Bookings can be made with our schools coordinator Liz Breslin – email admin@festivalofcolour.co.nz or call 027 622 5075 to get an information pack. RNZB Senior Dance Educator Pagan Dorgan will be in Wanaka for a week running workshops in local schools. See page 25 for more on the RNZB public performances. The 3 Speed Crunchbox circus is coming to town. They will run workshops and showcase their spectacular circus tricks and slapstick comedy in local schools. Musician and sound artist Campbell Burns will be working with high school students. Catch his Water Table sound installation at the Wai / Water / Wanaka exhibition. Travelling storyteller Tanya Batt will be telling stories for junior students in our district all week. The Tequila Mockingbird Orchestra are bringing their multicultural community sounds to our schools with two days of in-school performances.